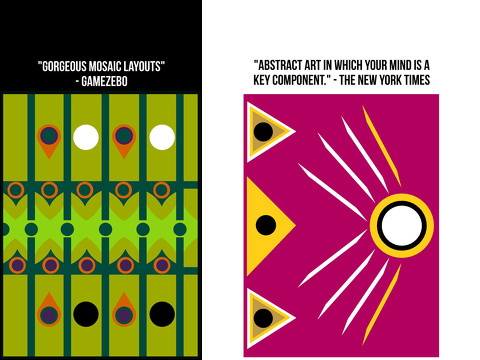 The Color Zen iPhone, iPod Touch, and iPad app is an intriguing, fresh, and stunning puzzler. Complemented by a cool, calm soundtrack, the colorful geometric puzzles are solved by breaking them apart piece by piece. As each move is made, color explodes across the screen and removes similarly colored pieces. Essentially, a new puzzle appears after each move until the border color is matched and the puzzle completely disappears. It is smart, addictive, and easily accessible, so it is not necessarily the most challenging puzzler in the iTunes AppStore. When you open the Color Zen iPhone app, you are greeted by a black home screen punctuated with vibrant colors and a chic, modern vibe. From the home screen, you can adjust music, access the in-app store, get game info, engage socially, and play. The streamlined gesture interface is thoughtful. The default setting for music is on, but one tap turns it off. Another touch turns on the music. This interface is free of an additional pop-up and eliminates gestures. This streamlined interface follows in the game play. For example, you can pause a game with a double tap on the screen. Pop-ups are helpful when they add value and share information, but not when they are redundant. To complete each puzzle, you must fill the screen with the border color in the final gesture. A puzzle may contain shapes of different colors, and each shape may have a shape of a different size and color embedded in it. The blinking colors on the screen are the areas of different color that may be controlled by gestures. To be successful, you need to drag colors, make them explode, and engulf all areas of similar color in the correct order. Shapes with embedded colors shed the outer layer of color first, then the interior color remains. You can drag blinking areas of color around obstacles. The border color may be used on multiple occasions, but it must be the final color to solve the puzzle. The pricing system of the Color Zen iPhone app is interesting and reasonable. You can unlock levels with your success for free for seven days, or you can purchase additional packages for $.99. You may also purchase skips for $.99 and $3.99. The Color Zen iPhone, iPod Touch, and iPad puzzle app is attractive, addictive, and highly recommended. 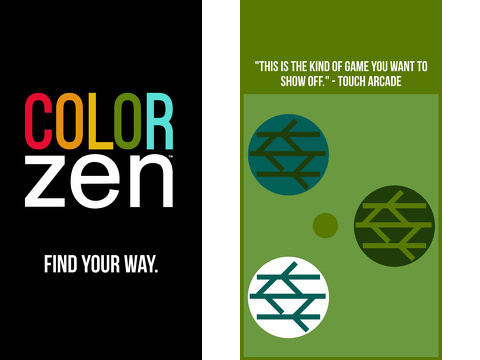 AppSafari review of Color Zen was written by Jenni Ward on September 13th, 2013 and categorized under App Store, Free, Fun, Games, Kids, Music, Puzzler. Page viewed 4428 times, 3 so far today. Need help on using these apps? Please read the Help Page.